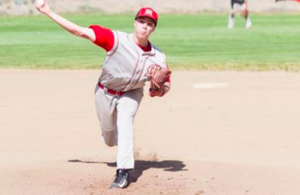 It was Déjà vu all over again between the Santana Sultans and the Granite Hills Eagles as once again the Eagles prevailed late scoring four runs in the bottom of the sixth inning to snag the victory. Things right away went in favor of the Eagles in the bottom of the first inning when Staci Chambers (1-1, R, 2 RBI, HR) took the 1-1 offering from Madison Mendez (1-3, RBI) and hammered it over the center field fence to give the Eagles the early 2-0 lead. The homerun by Chambers scored Aylani Ottley (2R) who came into run for Haley Johnson (1-1, 2B) who had doubled. Moving to the top of the third inning with the Sultans trailing they would take a 3-2 lead in the top of the third inning as Mackenzie Bennett smashed a liner up the middle to which scored Natalie Sims (1-4, R) and Krysten Service (1-2, R) who scored on the throw to tie the game at 2-2 and Marilyn Downing (RUN) would score on a wild pitch to give the Sultans the lead. The Sultans would add to their lead in the top of the fourth inning on a two out base hit by Mendez which scored Emma Leggett (1-3, R) who had singled in the inning to make it 4-2. Another run for the Sultans in the top of the fifth inning pushed their advantage to 5-2 as Ashley Madrigal scored when the Eagles committed an error on a ball hit by Shelby Holmquist (RBI). Santana really could have broken the game open with some insurance runs in the top of the sixth inning. Things started with Service singling, Mendez hit into a fielder’s choice in which Service was thrown out at second, Downing came into run for Mendez, Bennett hit a ball to second that was misplayed and was safe, Mackenzie Sims into run, Madrigal would single to center which loaded the bases with only one out. With the bases packed and Chambers in the circle who came into relieve Catie Dobbs earlier in the contest the Eagles were in some trouble. Next up for the Sultans was Joey Barkhimer who hit a lined shot to center that looked like it was going to drop for a base hit but center fielder Bailey Wallace leaped out of her cleats forward and caught the ball for the amazing diving catch, Downing came into score or so she thought. The Eagles faithful was yelling throw it to third base and Wallace did and the umpire called out for leaving early and end the inning. This prompted Santana’s Coach Arnold to appeal but to no avail. Still trailing by three runs the Eagles knew they needed to do something as they were running out of time. Leadoff hitter Johnson managed to draw a walk, Ottley into run, Chambers followed with another walk, Erica Simon (RUN) into run, Wallace laid down a sacrifice bunt and actually reached on an error to load the bases. This time around things were looking up for the Eagles as they had the bases full and no outs. However Mendez was able to strike out the next two batters. Only needing one more out to get out of the jam and the inning, Mendez was in control. 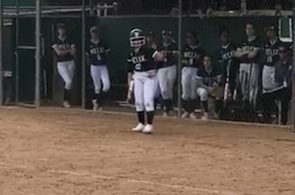 However McKenzie Boehm (1-3, R, 2 RBI) had other ideas as she took the Mendez offering and laced it up the middle to center which allowed both Ottley and Simon to score to cut the deficit 5-4. With Boehm on second and Wallace on third and two outs up came Brooke Bertussi (1-3, 2 RBI). Before her at bat in the bottom of the sixth, Bertussi had not done anything all day against Mendez. She was able to work the count to 2-2 and on the very next pitch she hit it to center field where it fell for a base hit which scored both Wallace and Boehm which gave the Eagles a 6-5 lead. It was a lead that they wouldn’t relinquish as Chambers was able to get the final two batters out to end the contest and complete the comeback. For the Eagles it was déjà vu all over as they had won the previous two regular season league contests in the bottom of the sixth last season. The first time was at Santana when Rylee Omahen hit a homerun over the left field fence to propel the victory and the second time was a Wallace homerun over the right field fence to propel that victory. 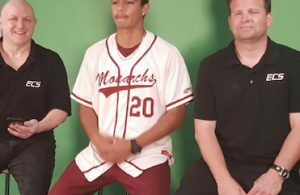 In the loss for the Sultans, Mendez went the distance going 6 innings, giving up 6 runs of which only 2 were earned on 5 hits while walking 6 and striking out 7. Starting the game for the Eagles was Dobbs who only lasted 2 innings in which she gave up 3 runs of which all were earned on 2 hits while walking 4 and striking out 2. Coming into relieve was Chambers who got the victory as she went 5 innings in which she gave up 2 runs of which 1 was earned on 5 hits while walking2 and striking out 4. With the win the Eagles are the only undefeated team in league play and with the loss the Sultans four game winning streak comes to an end. Grossmont’s Jordan Brown (4-4, 3R, 2 RBI, HR) was red hot against the Wolf Pack on Friday as she went 4-4 scored three runs and drove in two runs as Grossmont stymied West Hills on the day. The Foothillers got on the board first in the top of the first inning as Brown blasted a two run homer over the center field fence that scored Kati Contreras (1-3, 2R, 3 RBI, HR) to make it 2-0. A few batters later Candace Henderson (1-2, 4 RBI, 2B) roped a two run double that scored Jaime Medlin who came into run for Samaria Roope and also Aly Almann which made it 4-0. West Hills answered with a run in the bottom of the first as Ashleigh Hartwig (1-3, R, RBI, HR) bombed a solo homerun over the center field fence to bring the Pack within 4-1. They would have more opportunities as Star Gaylord (1-3) followed with a single and Gabby Clippinger (1-3, 2B) reached on an error but Roope would get out of the jam. After pushing across another run in the top of the third to lead 5-1. West Hills would threaten in the bottom of the third inning with two outs as Clippinger doubled and Savanah Henderson walked. However Roope once again got out of the inning. 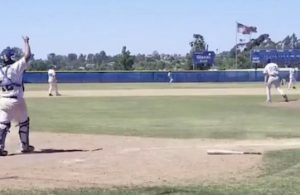 Grossmont would go on to add more in the top of the fourth on a three run blast by Contreras. The homerun scored both Katie Appenzeller (1-4, R) and Kimmy Bond (3-5, R, 2B). Taking the loss for the Wolf Pack was Emma Bentley who only went 3 innings while giving up 8 runs of which 6 were earned on 9 hits while walking 2 and striking out 2. Getting the victory for the Foothillers was Roope who went the distance for the complete game 7 inning victory, she gave up 1 run which was earned on 6 hits while walking 1 and striking out 7.